Kashmiri villagers carry body of Burhan Wani, chief of operations of Indian Kashmir's largest rebel group Hizbul Mujahideen, during his funeral procession in Tral, some 38 Kilometers (24 miles) south of Srinagar, Indian-controlled Kashmir, July 9, 2016. Eight people died in clashes and more than 90 security personnel were injured as protests engulfed Indian Kashmir a day after a top militant was killed by security forces. It was the worst violence in recent months in India's only Muslim majority region. Clashes erupted in towns across southern Kashmir as thousands of residents, shouting anti-India slogans, defied restrictions and turned out to take part in the funeral of Burhan Wani in Tral town, about 60 kilometers south of the summer capital, Srinagar. The 22-year-old Wani and two other militants were killed by police Friday in a shootout in southern Kashmir. Police said the crowds Saturday attacked three police stations, set fire to two other buildings and pelted security forces with stones. The violence took place despite the hundreds of armed police in riot gear, and paramilitary soldiers who patrolled the streets. Police said seven people died in "retaliatory action" by security forces, while one man drowned as he tried to flee the protests. Kashmiri villagers shout slogans during the funeral procession of Burhan Wani, chief of operations of Indian Kashmir's largest rebel group, in Indian-controlled Kashmir, July 9, 2016. With tensions likely to continue as separatist leaders have called for a three-day shutdown, police officials in the state appealed for calm. Internet services were shut down and train services have been temporarily halted. Wani, the son of a school headmaster and a school dropout, had come to be known as the "new face" of militancy in Kashmir. His photos and videos urging young men to join him and take to arms were widely circulated on social media. Analysts said the young militant, who had frequently denounced security forces for using excessive force against protesters, posed a new challenge as he motivated many local youths to join the ranks of militants. Security forces have called the killing of Wani a major success in their anti-militancy operation. But some Kashmiri leaders fear otherwise. In a tweet, Kashmir's former chief minister, Omar Abdullah, said, "Burhan's ability to recruit in to militancy from the grave will far outstrip anything he could have done on social media." India has long blamed Pakistan-based Islamists for fomenting a violent insurgency that raged in the region until the 2003 killing of tens of thousands. But security analysts say separatist sentiment is again on the rise among some young, disaffected people in Kashmir and poses a fresh threat to the lull that was experienced in the rebellion. 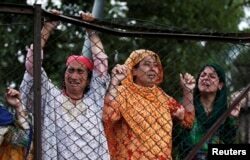 Kashmiri women mourn the death of Burhan Wani, a separatist militant leader, during his funeral in Tral, south of Srinagar, July 9, 2016. However, Kashmir's additional inspector general of police, S.M. Sahai, said on Saturday that militancy in Kashmir has been contained, but admitted that there has been a "slight spurt" in recent months. "We would like that local recruitment goes down and does not take place as it was a couple of years back," he said. Sahai appealed to parents to counsel their children to ensure that they don't join this path. Last month, Kashmir witnessed several militant strikes, including one in which eight Indian police officials were killed. Divided between Pakistan and India, the Himalayan region is claimed by both countries.